Although arguably best known as elder brother and primary musical influence to the legend that is Stevie Ray Vaughan, Jimmie is undeniably a wonderful guitarist in his own right and any serious student of blues guitar has an obligation to check him out. Both as a player and as a bandleader, Vaughan's relevance is notable, prompting Stevie to proudly declare, "My brother Jimmie actually was one of my biggest influences on my playing. He really was the reason why I started to play". Jimmie's music encapsulates all that is good about the earlier roots-based urban blues styles. He may have a raw and direct style, and he's not the most technically demanding player out there, but it simply sounds wonderful! Clarity is the order of the day, both from a tonal and a melodic perspective. The simplicity of Vaughan's music allows the inherent beauty of his phrasing to shine through. He's got great timing, decisive note choice, great rhythmic phasing, confident, bold and authentic delivery and a killer tone. There are two complete studies for you to learn in this lesson. 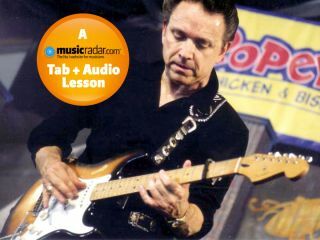 The first takes its inspiration from Vaughan's fiery soloing style he showcased with his work with The Fabulous Thunderbirds. With considerably more notes per second you'll need to use a pick and dig in hard. Our second 24-bar piece shows how Vaughan's style has evolved, favouring the fingers over the pick, using much more space with less notes but more expressive devices such as slides, bends and tremolo which, along with his sublime tone, arguably gives his sound even more authentic blues vibe and feel. The most significant development to Jimmie's sound is his now near-constant use of the capo, selecting its position relative to the appropriate root note on the sixth string. So, if the song is in G, the capo is at the 3rd fret, if it's in C then it would be the 8th, and so on. As Jimmie says, "It's a way to play in E all the time…and that helps me with my playing, and helps me sound more like myself". As always, treat these solo studies as the springboard to further exploration, and remember to enjoy yourself. Don't be mistaken into thinking that the blues is all about doom and gloom, this is 'good times' music of the highest order. [Bars 1-4] The concept at work in our first Vaughan-inspired study is to punctuate each C minor pentatonic phrase (C Eb F G Bb) with a harmonically appropriate C9 chord voicing. This is surprisingly difficult to do, especially at this tempo, so make sure you kick things off at a manageable pace and turn up the heat as your accuracy and coordinating comes together. [Bars 5-8] Continuing along similar lines, here our harmonic sequence shifts to the expected IV chord (F9) before returning to the I in bar 7. We add the b5 into the single-note mix to create what is commonly known as the 'blues scale' (R b3 4 b5 5 b7) although this is far from the only melodic device used within the blues idiom. What we do get with these notes, however, is all the fun of pentatonic with a sense of extra dissonance, tension and bluesy grit so you should definitely familiarise yourself with this set of melodic intervals. 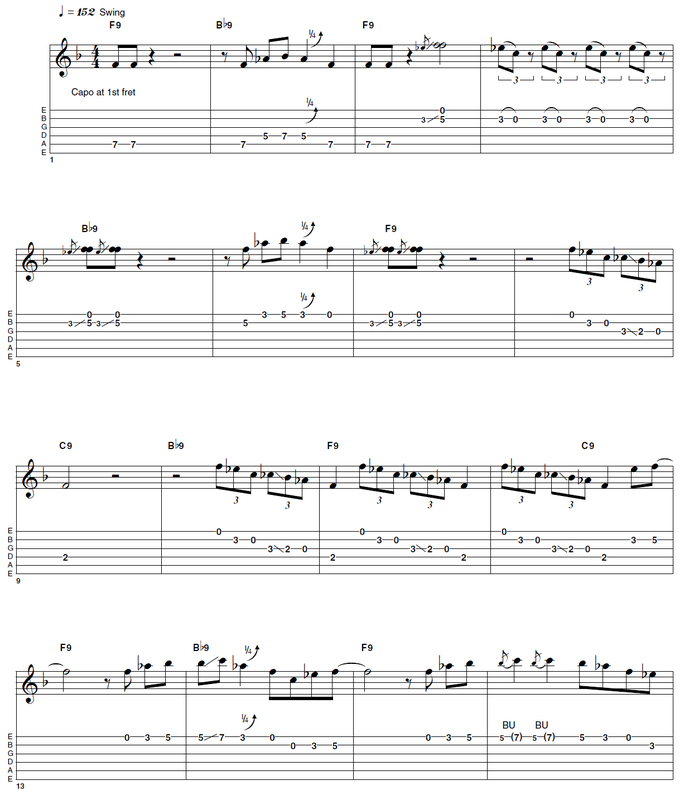 [Bars 9-12] More 'blues scale' action here in bars 9-10, along with a shift to a more chord-tone based soloing approach in the final two measures. It's important to watch how Vaughan 'boxes-in' the strongest notes of our underlying C7 tonic chord (C E G Bb), albeit in single-note form - a simple but highly effective improvisational device in many forms of music and not just blues phrasing. [Bars 1-4] Simple, direct and bold statements are the order of the day for our second solo study. don't be afraid of space (Jimmie certainly isn't) and don't forget to clamp a capo onto the 1st fret so that our open string pull-offs are now in the key of F. From a notes perspective, it's F minor pentatonic all the way (F Ab Bb C Eb). 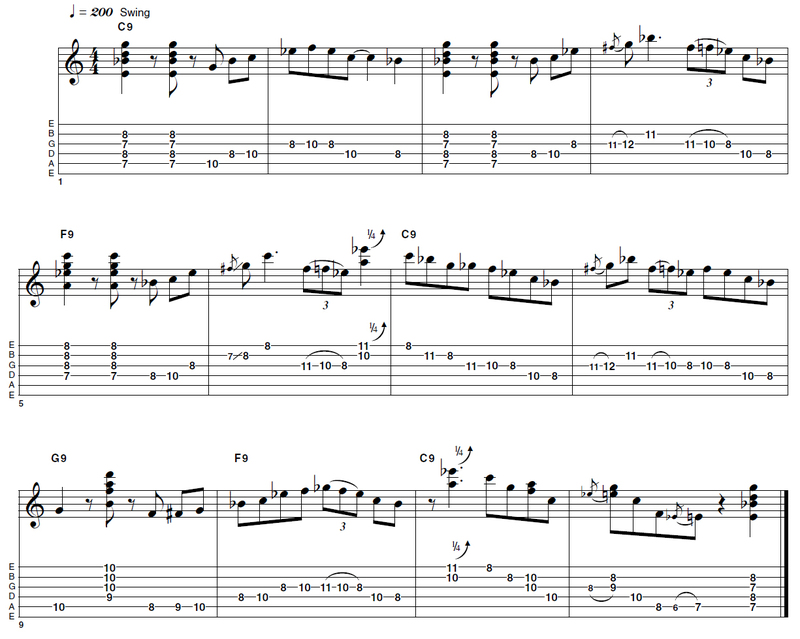 [Bars 5-8] Here we see how Jimmie expertly combines the first and second forms of minor pentatonic scale, the E minor and the D minor shapes along with a selection of open string-fretted note unisons. Melodic lines of this nature originate from the Mississippi delta region and date right back to the origins of the blues genre. [Bars 9-12] We conclude our first 12-bar chorus with a simple, though effective, descending phrase derived from the F 'blues scale' (F Ab Bb Cb C Eb), maintaining interest through multiple repetitions by rhythmically placing the phrase at varying points within each bar. Clever stuff! [Bars 13-16] Jimmie is equally adept at horizontal and vertical motion whilst negotiating pentatonic scales and here we see him in horizontal mode. Vaughan breathes life into our old friend, the minor pentatonic, with a choice selection of slides and bends. 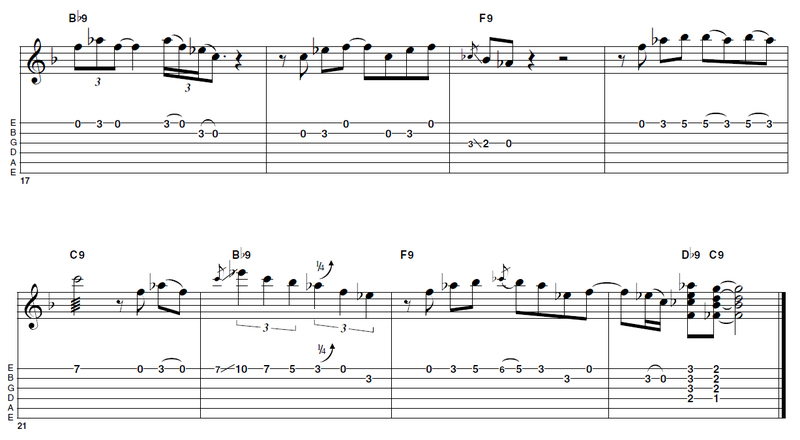 [Bars 17-20] As Jimmie is going in the 'fingerstyle' direction, he really needs to use pull-of s and hammer-ons when he wants to turn up the pace when soloing. It's not that easy to alternate pick across the strings with one finger, although Jimmie sometimes tremolo picks on one string using his second finger. Here we see how he might negotiate some rapid pull-off s derived from, you guessed it, the minor pentatonic scale of F! [Bars 21-24] Here's that tremolo picking technique. For the C note in bar 21 Jimmie flicks his second finger back and forth across the string, resting for support and balance by placing his thumb either on the bass strings, the guitar body or the top edge of the neck. Yet more rhythmic ingenuity in bar 22, with a clever triplet comprised six-against-four figure, before a couple of well-placed 9th chords bring our study to a close.